X-BAG Collection is crafted of a durable nylon, trimmed with Tuscan full grain leather. What began with a globally patented bag, called Sportina a foldable x-bag that tucks away into an envelope, is now a full line comprised of 4-wheel spinners, duffles, travel totes, backpacks, and more. X-BAG is as durable as it is easy to wear. Incorporating Italian design, water proofed polyamide, and full-grain, vegetable tanned, Tuscan leather trims and luxurious lining. X-BAG is always water resistant, lightweight, washable and wont fade in the sun. Add an X-BAG as an extra bag to your travel collection, or create your own signature style with our core and seasonal colors. 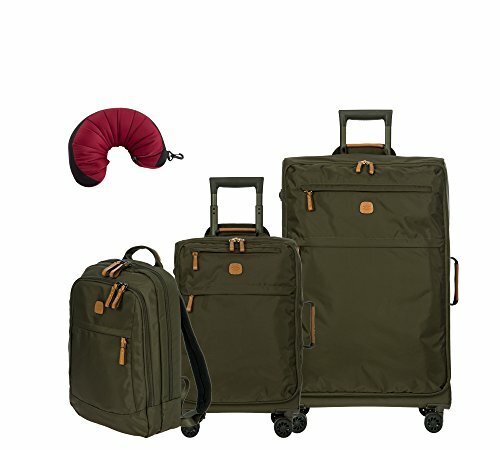 This Bric's X-Travel set includes a metro backpack, 21" and 25" spinner, and a travel pillow. This Metro backpack is based on the concepts of function, fashion, and convenience in everyday life. The metro backpack is made from 100% polyamide, making it ultra lightweight, water-resistant, and durable. Features include adjustable straps with a divided interior with organizational pocket and two double-zip compartments. The large external zipped pocket is perfect for keys and travel essentials. This 21 inch comes with all the features needed to face every trip in perfect comfort, without ever forgetting about style. Made in durable, easy-to-clean satin nylon, this carry-on trolley has been designed to guarantee maximum lightness. Its dimensions mean that it can be taken on board the plane with you as hand luggage. Made in satin nylon; two large zipped pockets are found on the front. This 25 inch trolley comes with all the features needed to face every trip in perfect comfort, without ever forgetting about style. Made in durable, easy-to-clean satin nylon, this carry-on trolley has been designed to guarantee maximum lightness. Made in ultra-durable, easy-to-clean satin nylon; two large zipped pockets are found on the front. The pull-along handle can be adjusted to different heights; when not in use it can be hidden by a zip closure; a top handle allows for easy lifting.